When a back injury forced Tony Ogden to ditch the construction trade and take up real estate, jumping back on a bike was a natural choice after his years of transportation cycling, tri competitions, road races and mountain biking. “I love being able to ride my bike and say I’m working at the same time. It’s the best of both worlds,” says Ogden, Managing Broker at TandM Real Estate in Seattle. Yes, TandM is a pun: Ogden sometimes rides the rounds on a tandem with partner broker Marisa Callaghan. In America’s bike-friendliest cities, chances are a few minutes of web searching will return at least one cycling realtor in the area. Broker Lauren Chao, of Compass real estate’s New York City operation, says she appreciates the light exercise and “brief reprieve from my cell phone” that riding provides. And, often, riding offers a faster trip in central business districts or dense urban neighborhoods. “I use Citi Bike when the weather’s nice and if it’s more efficient than the train or car,” says Chao. She once had a client hop on the back of her bike to tour East Village apartments. “He has become a longtime client,” she says. While tools like Bikescore can help house hunters zero in on promising neighborhoods, nothing matches the up-close and personal experience of rolling through a new neighborhood to get to know not just the property itself, but the whole community. As cycling has grown, bike amenities have become selling points, and scouting on two wheels confirms that the riding is comfortable and that groceries, pharmacists and other essential services are easily accessible by bike. At each first meeting with a new client, Washington, D.C. Compass agents Jeanne Harrison and partner Phil Guire invite?but don’t push?clients to ride. “Having someone entrust you with one of their life’s biggest financial decisions requires them to feel comfortable with you,” Harrison says. She built biking into her work in 2009 and makes her rounds in business attire on her Linus, usually after a morning kitted out for a twenty or thirty mile ride on the region’s Mt. Vernon Trail. “I like to bike, but not everybody does,” she says. True, a bike may not be the best house-hunting vehicle for families with children in tow, or in dreary weather, or for clients interested in a home farther afield. But clients who pass on riding themselves may still find that a cycling agent has a more intimate knowledge of neighborhoods that car-bound competitors may find hard to match. Clients range from young couples looking at starter homes to well-established older buyers looking at upscale properties. Harrison and Ogden estimate that 20 to 25 percent of their clients seek them out at least in part due to their cycling. 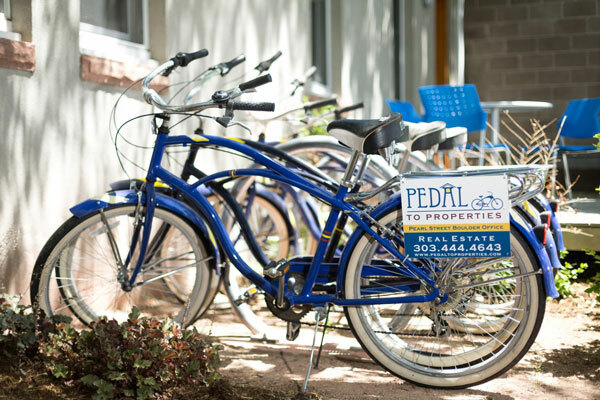 Pedals to Properties (PTP) in Boulder, CO, fully exploits the promotional capacity of bike-based real estate service. PTP posts small fleets of bikes at their offices and at two area hotels. The co-branded bikes are checked out via iPad and free to PTP clients, hotel guests and the public. PTP President Tim Shea says that dozens of users have become clients over the last few years and the firm has collected a mailing list of riders, whom he expects down the road will translate into prospective clients. Shea is also considering adding electric bikes to the PTP fleet to encourage enthusiastic but hesitant house hunters to try touring homes via bike.